Yellow Horse is set during a time when trust was just a thin line between the white man and Native Americans. This is the first novel in Dan Arnold's Sage Country series and sets the foundation for this wild Texas country tale. Yellow Horse focuses on a Comanche Indian who is half white and a scout for the Texas Rangers. His skill as a warrior makes him valuable to understand and communicate with the other tribes, but it is his tracking ability and ruthlessness that get the results the white men fail to achieve. Though James Yellow Horse lives among the white men the majority of time, he is slow to give up the Comanche ways and embrace Christian beliefs. After rescuing Colonel Meadows's daughter, Yellow Horse witnesses the true meaning of Christianity. This novel is an introduction to Texas Ranger Sergeant John Everett Sage, who is featured in the other books in this series. I enjoyed reading Yellow Horse and hated whenever I had to put it down. Dan Arnold is an excellent storyteller and brings his characters to life as they struggle in this untamed territory. 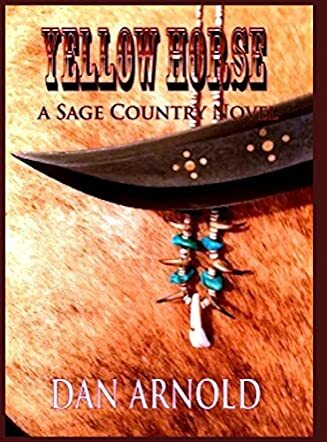 Dan Arnold's love for horses coincides with a time when horses were the main transportation, and though his novel isn't about horses, he includes the rare and beautiful Medicine Hat horses within his story. Dan Arnold writes his western theme novel similar to Zane Grey and Louis L'Amour, drawing the reader in quickly and introducing them to a world of danger. I relished the author's choice of topics and the discretion he used when writing about sensitive subjects.